Online voting for the next AALL vice president/president-elect, treasurer, and Executive Board members opens on Monday, October 1 and runs through 11:59 p.m. (EDT) on Tuesday, October 31. Voting instructions will be emailed out to all eligible voters that morning. Members of the board represent you and your interests as law librarians. It’s important to make an educated decision, and we encourage you to learn more about the candidates before voting by reading their biographies and statements, as well as the Q&As with the candidates featured in the July/August issue of AALL Spectrum on AALLNET. You can also listen to the recordings from the treasurer’s forum and the Executive Board members candidates forum. Members will have the opportunity to ask a question during the forum via live chat. Keith Ann Stiverson, chair of the Nominations Committee, will serve as moderator for the forum. The Call for Proposals for the 2019 AALL Annual Meeting is open through Monday, October 1! Inspired by the program ideas AALL members shared this summer, the Annual Meeting Program Committee (AMPC) has compiled a list of “must-have” program topics that AALL members have identified as being vital to their professional education. Get valuable speaking and/or program development experience and make an impact on your profession. Propose a program! Explore our resources for program proposers, and use the online Program and Workshop Proposal Collection site to develop your proposal in your own workspace, share it with your colleagues, and submit it online by October 1. The AMPC will evaluate all submitted proposals using a comprehensive rubric, focusing on their relevance and description. We can’t wait to see your proposals! Mark your calendars and book your Washington, DC accommodations—you won’t want to miss the 112th AALL Annual Meeting & Conference! Members – Free / Nonmembers – $60Libraries collect data on users—from who they are to what they do as they interact with the library and its services—and utilize that data for various purposes. Technology that allows tracking on an entirely new scale heightens concerns about user privacy. Are those concerns universal? Are all libraries affected in the same way? How can librarians think constructively and proactively about best practices regarding what data they collect, what they do with it, and how long they keep it? This webinar will open participants up to ideas of user privacy and organizational priorities to enable them to discover the privacy concerns relevant to their own institution. Vulcans are smart, objective, and don’t assume anything. They don’t trust data unless they’ve reviewed and analyzed the primary documents themselves. They don’t try to read people’s minds or guess their intentions. When confronted with the chaos of information gathering, they dig in and calmly ask simple, direct questions. Typical Vulcans are comfortable being critical of their fellow travelers and giving their opponents the benefit of the doubt. In this webinar, learn how to decode sources, data, and jargon, and use Vulcan-like strategies in your day-to-day work. 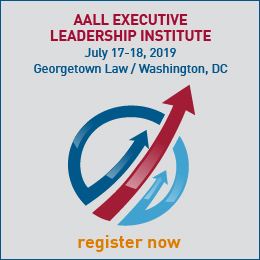 The 2019 AALL Management Institute will provide managers with skills that help them excel in their roles, support organizational strategy, and solve business issues. From engaging staff for high performance to building partnerships, this three-day institute will take your management skills to the next level. Managers (including aspiring managers) will have the opportunity to collaborate with colleagues from across the country, learn in a small group setting, and develop techniques that have long-term value and impact. Maureen Sullivan is an educator and organization development consultant whose practice focuses on the delivery of consulting and training services to libraries and other information organizations. She has extensive experience with organization development, strategic planning, management skills and leadership development, introducing and managing organizational change, work redesign, and the identification and development of competencies. Does your chapter, special interest section, committee, or caucus have an educational event that needs funding? If so, consider applying for an AALL/Bloomberg Law Continuing Education Grant. Grant requests are accepted at various times throughout the year. The next deadline for grant applications is October 15. At this summer’s AALL Annual Meeting & Conference, attendees gathered to learn, network, and share knowledge. As an AALL member, you can access the educational session recordings, whether you joined us in Baltimore or not. You can easily listen to sessions from your desktop or on the go—take advantage of this complimentary member benefit, just a few clicks away. AALL 2018 session recordings sponsored by LexisNexis. Have you attempted to run identical searches on various research platforms only to find that you receive significantly different results from each service? This 2018 AALL Annual Meeting program, coordinated and moderated by Susan Nevelow Mart and featuring speakers Ed Walters (Fastcase) and Tito Sierra (LexisNexis Legal & Professional), gave insight into the mystery of the various search engines. This session builds on one of 2016’s most popular sessions and includes an update from Mart and her research on how algorithms work. Find this and many more continuing education programs and webinars on AALLNET. See what else is on-demand. When we think of leaders, we usually think of those in management positions with formal supervisory responsibilities. But those who aren’t managers can be leaders too. That is, non-managers can lead by exerting influence, particularly in organizations such as libraries that value collaboration among staff. To encourage all of us to think about leadership, the Leadership Development Committee highlights short articles in the monthly AALL eNewsletter and Education Update. Have a suggestion or request for a topic? Please email T.J. Striepe. Kristina Alayan has been appointed Director of the Law Library and Assistant Professor of Law at Howard University School of Law. Alayan previously served as Head of Reference and Adjunct Professor at the E.B. Williams Law Library at Georgetown University Law Center. 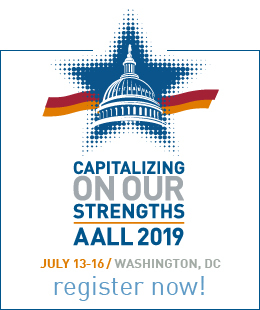 AALL seeks more news about members’ achievements, job changes, and connections with the legal information community. Please send your news to Heather Haemker, AALL publications manager. Sarah Leverette was a trailblazer for women in the legal field and a pioneer among South Carolina women in law. She was the only woman in her graduating law class at the University of South Carolina in 1943, following just two women who finished ahead of her. Her many accolades include working for a quarter-century as the first female faculty member at USC’s law school, serving as commissioner and chairwoman of the S.C. Industrial Commission (now the Workers Compensation Commission), and leading the influential League of Women Voters. She was given the Martha Browning Dicus award for public interest law by the South Carolina Women Lawyers Association, and was an honorary member of AALL and mentor to many law librarians. She passed away August 29, 2018. Carolyn A. Moore was a longtime law librarian. Toward the end of her career, she served as librarian for the Chicago Municipal Reference Library. One of her career highlights was receiving the Lifetime Achievement in Law Librarianship Award in 1995-1996 from the Chicago Association of Law Libraries. She passed away March 12, 2018. The AALL eNewsletter carries brief announcements of members’ deaths. Traditional memorials should be submitted to James Duggan, Law Library Journal editor. 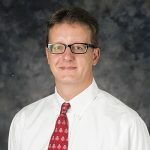 In this month’s member profile, Kevin Carey, technical services librarian at the Ohio State University Moritz Law Library in Columbus, Ohio, discusses connecting with peers through AALL’s dynamic member search. See more AALLNET Monthly Member Profiles and view AALL Spectrum Member and Leader Profiles on AALLNET.